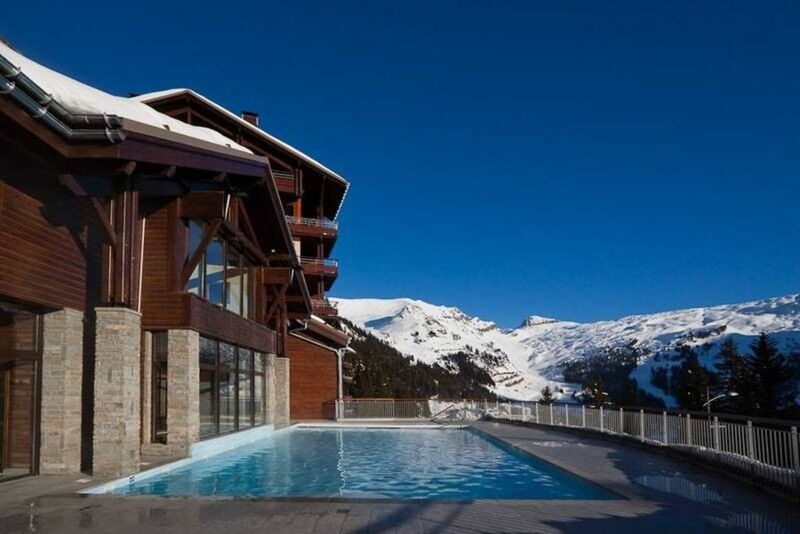 Luxurious ski-in, ski-out apartment in Flaine. Access to 265km of slopes, 18 hole golf course, Summer & Winter resort, Wellness & Fitness centre, Shops & restaurants, Pierre y vacances 5 star premium luxury development at the base of the French Alps with excellent snow record and off-piste paradise. Winter and summer activities and entertainment. Two bedrooms, two bathrooms tastefully decorated quiet apartment with full facilities for self catering. Fully equipped kitchen. CD/DVD Player, , wireless internet access,open concept living, dining, kitchen area. underground parking, secure ski / board / equipment locker, 24hr secure reception, elevators to apartment access. Private terrace with spectacular mountain views Private rental. Try a winter or a summer stay. The apartment has a heated outdoor pool with jacuzzi ski school, lift pass purchase, all close by. Free shuttle bus in evenings to local restaurants and bars. Contact us if your request is outside of this period. The kitchen is fully equipped so if you want to completely self cater you will find everything you need. We have added a microwave. There are laundry facilities in the apartment complex available for everyone to use. The sofa bed in the living room sleeps 2. it is suitable for 2 children but not 2 adults. We can also provide a travel cot when required. A week out in Flaine with some of the family. Nice swimming pool, indoor bubble pool, sauna and steam room in the complex. Large apartment in good condition and well looked after. Had a great time. A very comfortable apartment with outstanding view of the mountains. We really enjoyed the convenience of ski in/ski out of the apartment building. The pool facilities were a lot of fun after a day of skiing, the apartment was well equipped. We especially loved Thursday and Sunday toasted marshmallows by the fire! Great apartment with everything we needed, plenty of towels, robes for the spa area and even some toiletries. The owners were very helpful and responsive before we left so that we knew exactly what we needed to. Fantastic facilities! Loved the pool and ski in ski out. The location and the facilities are what really make this property. The kids (6.5 and 5), are a bit young to ski all day, so it was great to have the outdoor pool in the afternoons. There is a shop 5 mins walk away and a small play area, which also made it super convenient for us. The owners were very helpful and extremely responsive. The only thing I would say is it could do with redecorating to make it a little more modern, but this certainly didn't detract from a wonderful stay in a very clean and well equipped apartment. We would definitely consider coming back! What a fantastic holiday! Ski in ski out was great, the ski locker room was next to the door onto the slopes and the ski run down to the chairlift was very easy. What could be better!! The apartment itself was perfect with comfortable clean beds. Our group was two couples so the apartment suited us very well. We both had our own private area and our own bathroom. The kitchen was well equipped including a slow cooker which we used a couple of times.The sauna and jacuzzi were busy sometimes but pick your times carefully and they'd be empty. The restaurant was quite expensive but we couldn't resist on the last evening and the food was amazing - well worth the money. We would definitely stay here again. Short 75min drive or easy transfer service from Geneva Airport. 30 minutes by auto route A40 direction Chamonix and then take exit 19 and continue 30 minutes into the Grand Massif mountains well marked destination Flaine village. Local taxis and free shuttle buses to nearby villages and ski stations, Morillions and Les Carroz. Flaine village is above 1500m elevation virtually ensuring a wintry setting for all snow sports and activities. Our Montsoleil resort is a self contained, all season resort perched just above Flaine village with easy access to all winter activities or golf and tennis facilities for the remainder of the year. We will send full directions of how to get there with the information pack we send out with the confirmation of booking. Other Activities: Kids ski clubs (Rabbit/ Piou Piou/ Green mouse snow garden) all close by.